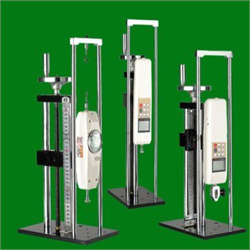 Function: Screw test stand are fit to the domestic and imported NK, NLB, ALB series point type of mechanical force gauge and HF series of digital mechanical force gauge, which are subject to the pull load and plug destructive force test, also can be installed with steel gauge or digital gauge. Users can clearly observe the displacement when testing. Features: For dual vertical and horizontal use, it can also be installed on the table (desktop) to achieve stable manual operation, simple and convenient.